An EVO livestream that was centered around Dead or Alive was temporarily taken offline last night, after a segment that was deemed to go against the “integrity” of EVO. The segment in question featured two gravure idols posing on stage. Below, you can see the apology from the EVO boss. Over on ResetEra, you can find an archive of the segments that were deemed a bit too risque for viewers. For those not in the know, gravure idols are women that primarily model in magazines and online, aimed at men in Japan. The DOA ad that aired on our stream does not reflect the core values of Evo or the FGC. We ended the stream temporarily to protect the integrity of our brand. We sincerely apologize to our fans. In that same ResetEra thread, the cutting of the stream after the segment hasn’t gone down particularly well. 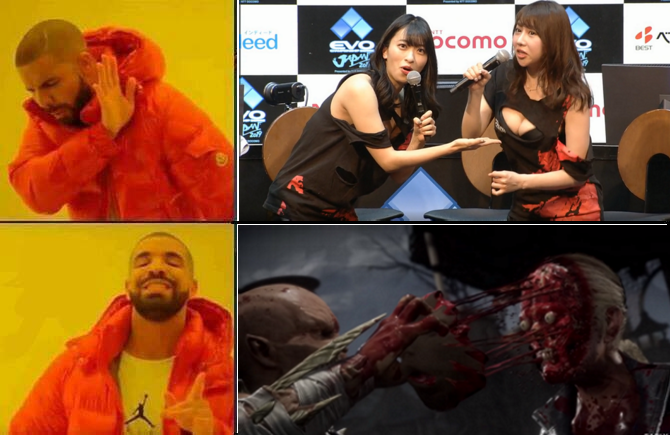 The meme just below has been circulated widely after the segment was cut and an apology from EVO was issued, pointing out the general hypocrisy of EVO for allowing Mortal Kombat’s violence, but finding fault with Dead or Alive’s fanservice elements. It should be noted that the Dead or Alive EVO stream resumed shortly after being taken offline, and at the time of writing, is still ongoing. Tagged with Esports,	Fighting,	News,	PC,	PlayStation 4,	Rated - Teen,	Shocking,	Team Ninja,	Xbox One.